Wednesday evening I took a flight to Oslo. My friend Wenche picked me up at the airport and we continued to a hotel nearby. A few hours sleep, breakfast and back to the airport where we met Kim Stian. Kim Stian was our physio on team Sponsorservice back in 2001 and 2002. It was a norwegian road pro team. Wenche and myself were part of this team. This was the time we became good friends and our friendship has grown stronger for every year that has passed. It was goo to meet Kim Stian after so many years. I remember the first time I met him and he told me he grew up in Hammerfest. I could not believe someone would be living so far north. I imagined a place with polar bears and eternal ice. A place I would love to visit. Now we are here, in Hammerfest. It is the northernmost town in the world. About 10.000 inhabitants and every 10th person you meet is a foreigner. The fishing industry employs many finnish and swedish women. However, today, gas is the biggest provider of jobs. Also oil has been found and at the moment there is a lot of building business going on here. An Italian oil company is on their way here. Another 110 work places will be offered in the near future. So my expectations of a sleeping town was completely wrong. There is a very international atmosphere here. The people are very friendly and you feel very welcome. Just an amazing place and I am happy that I have got this chance to visit this city. Yesterday when we arrived I put my bike together and went for a ride with Kim Stian and the race organizer of Skaidi Xtrem, Odd Peder. It was a nice ride with some sight seeing as well. In the evening we were invited to the tourist info and were shown around in the little museum they have there. 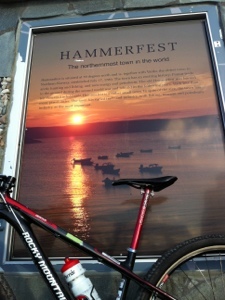 It was very interesting to hear about the history of Hammerfest. After a day and a night in Hammerfest we are soon heading to Skaidi. It is a 45 minutes drive from here. Tomorrow I will take part in Skaidi Xtrem. 47km on trails. A lot of work to get around the course, but it will be so much fun. More about Skaidi later on. Stay tuned!